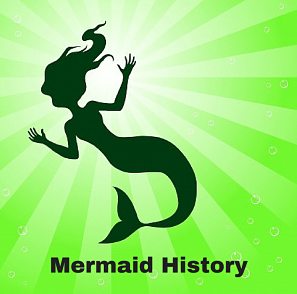 Before writing Between Land and Sea, I researched mermaid sightings. I expected to find only a handful of examples and was surprised by the lengthy list and vivid descriptions that emerged. So much so, that I’ve devoted several posts to this topic. Today, I will focus on ten documented sightings before 1800. 6. 1403: During a heavy storm, a mermaid drifted inland through a broken dyke on the Dutch coast. At first afraid but later intrigued, several local women and their servants befriended the mermaid. They took the mermaid home and tried to domesticate her, clothing and feeding her dairy products and meats. After a number of thwarted escapes into the sea, the mermaid resigned herself to her new life and died fifteen years later. John Swan, an English minister, described her story in Speculum Mundi, a book released in 1635. 7. 1493: After spotting three mermaids rising from the sea, Christopher Columbus wrote in the ship’s journal: “They were not as beautiful as they are painted, although to to some extent they have a human appearance in the face.” He noted that he had seen similar creatures off the coast of West Africa. 10. 1797: While walking on the shore of Sandside Bay (Scotland), schoolteacher William Munro spotted a mermaid sitting upon a rock. In his letter to Dr. Torrance in Glasgow, he wrote: “…my attention was arrested by the appearance of a figure resembling an unclothed human female, sitting upon a rock extending into the sea, and apparently in the action of combing its hair, which flowed around its shoulders, and of a light brown colour…The cheeks ruddy, the eyes blue, the mouth and lips of a natural form, resembling those of a man; the teeth I could not discover, as the mouth was shut; the breasts and abdomen, the arms and fingers of the size in which the hands were employed, did not appear to be webbed, but as to this I am not positive.” The complete letter appeared in The Times of London on September 8, 1809.